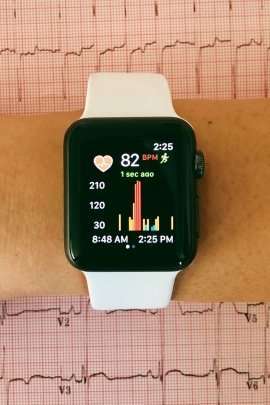 "Given the broad and growing use of smartwatches and ready accessibility of downloadable mobile applications, this approach may ultimately be applied to efficiently screen for AF," said senior author Gregory Marcus, MD, MAS, a UCSF Health cardiologist and director of clinical research in the UCSF Division of Cardiology. "By identifying candidates for appropriate anticoagulation treatment, we might ultimately leverage common wearable devices to reduce major thromboembolic complications, even death." In the JAMA Cardiology study, Marcus and his colleagues assessed data from three sets of participants, starting with a remote group of 9,750 participants in the UCSF Health eHeart Study. This group, which included 347 people with known AF, used the Apple Watch and an app developed by Cardiogram, Inc., to provide more than 139 million measurements of heart rates and step counts in workout mode to train the app's deep neural network. A subset of these patients used an AliveCor smartphone device equipped with electrodes to obtain a single electrocardiogram (ECG) to help train the algorithm. "We also learned from this study that a novel method can be utilized to train a deep neural network using less data while still achieving high accuracy," said study co-lead author Geoffrey Tison, MD, MPH, assistant professor of medicine. "This is especially relevant when applying deep neural networks to medical tasks where the disease-specific data is often costly to label with a gold standard and where the datasets are relatively small in sample size compared to those for deep learning applications in other fields." Among the study limitations, Apple Watch was the only smartwatch used, so similar devices may not be as effective. The researchers noted possible selection bias, as a number of participants contacted for the study did not complete initial surveys and link Cardiogram accounts. All patients also either owned a smartwatch or, for the cardioversion cohort, had a coordinator to assist with device setup, so results may not generalize to less "tech-savvy" individuals. As data focused on those with known AF, researchers did not show the ability to identify a new diagnosis of the disease.